What do you think when you hear the word “creative”? Writers? Artists? Dancers? Maybe a combination of all the above, and musicians, poets, and all else beside thrown in for good measure? Thanet’s incredibly diverse when it comes to creativity; there are dance schools, artists’ communes, writers’ groups, poetry slams … I’m missing out a lot, I suspect, but one particularly interesting thing was Margate Bookie. 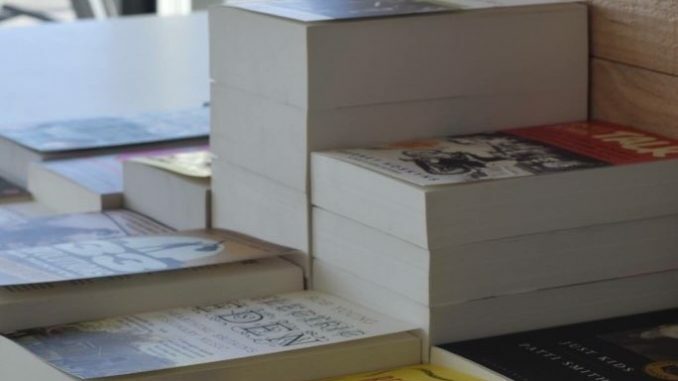 As its name suggests, it’s a chance to celebrate all things book-related, and is based in Margate; an event that does exactly what it says on the tin. I approve. I had the opportunity to pop in on both the Saturday and the Sunday, albeit briefly, and it was fascinating; I caught the end of a talk by Nigel West, a very well-known author on intelligence and security matters, and then got to spend some time with him afterwards and talk in more depth about intelligence gathering, which I’m rather geekily fascinated by. I then strolled down to the Turner alongside fellow writer and IoT News columnist Seb Reilly, where we chatted to people staffing the Thanet Writers stand, and I got the chance to earwig on conversations about the desires people have to write. I was genuinely interested, because sometimes people seem afraid of considering their writing as anything more than a general hobby, and yet I see the burning passion in their eyes as they talk. I was introduced to once such writer, Sam Kaye, during my Saturday afternoon down in Margate, and his book concept sounds fascinating; I shan’t share any details, as it’s down to him to decide when it’s a good time to share the storyline, but reassured it’s good. However, he seemed unsure as to whether he was allowed to consider himself a writer, and I corrected him; of course he’s a writer. He puts down his passion on a page and clearly thrives on it, but also engages with the literary community, listens, shares, and works to improve himself – the signs of a good author. I popped into the Bookie again briefly on Sunday, just to see what was going on, and had the chance to catch up with a couple more writers of note, as well as be roped into a podcast, run by the Bookie, when Seb caught me as I was quite happily browsing the booksellers’ tables. Before I knew what was happening, I was in front of a microphone and talking to a lovely woman about creativity in Thanet. It gave me the idea for this column, so I shan’t grumble, but Seb is a bad influence on me and I urge you to consider that when you read any future columns of his. So, there you are; Thanet and its creativity. Why is it that certain areas have a particular focus on a particular field? Who knows, but I for one am very glad that creativity is Thanet’s particular thing. I feel like I belong to a strong, interconnected community as a result, and it’s reassuring to know that I’m not alone.